The Shimadzu GC-2014 gas chromatograph system housed in Room 218 is equipped with both a flame ionization detector (FID) and an electron capture detector (ECD) and the Greenhouse Gas Analyzer configuration provides a unique turnkey system equipped with 1 sample loop, 3 values and 5 columns allowing for the direct quantification of CO2, CH4, and N2O concentrations from the same sample in ~8 minutes per sample. This instrument is primarily used to measure wetland soil gas fluxes as well as water column and benthic fluxes from estuarine and marine ecosystems. The Shimadzu TOC-VCSH (Total Organic Carbon) Analyzer with TNM-1 (Total Nitrogen Measuring kit) Module and ASI-V autosampler is housed in Room 218 and is primarily used for simultaneous analyses of dissolved organic carbon (DOC) and total dissolved nitrogen (TDN). [TDN measurements allow for the determination of dissolved organic nitrogen (DON) when nitrate and ammonium are also measured]. The TOC-VCSH can also be used to measure total organic carbon (TOC), total nitrogen (TN), and total inorganic carbon (TIC) concentrations of water samples. 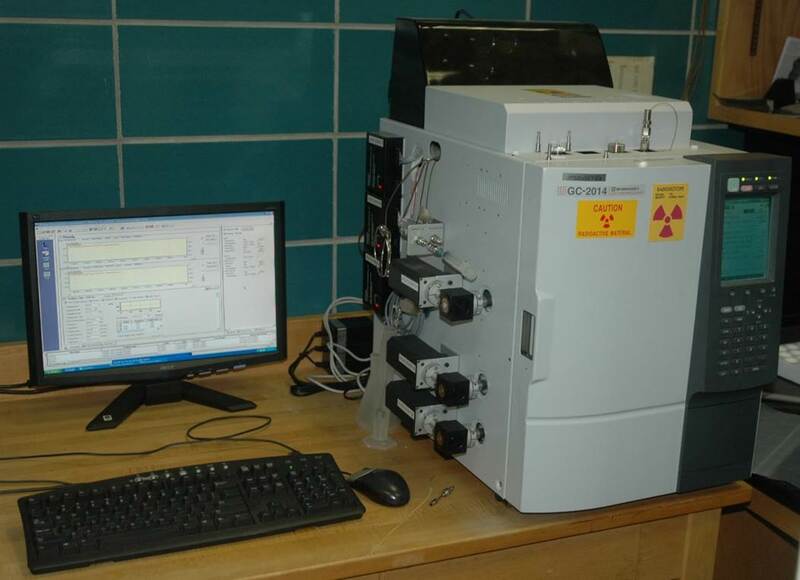 A Lachat Instruments QuikChem® FIA+ 8000 Series Automated Ion Analyzer with an ASX-400 Series XYZ autosampler is housed in Room 222 and is often used for the analysis of dissolved inorganic nutrient (NO3- + NO2-, PO43-, SiO2, and NH4+ ) concentrations. Samples are analyzed simultaneously for dissolved NO3- + NO2-, PO43- and SiO2, but separately for dissolved NH4+ to prevent contamination of the samples by fumes from the NH4Cl buffer used in the analysis for NO3- + NO2-. 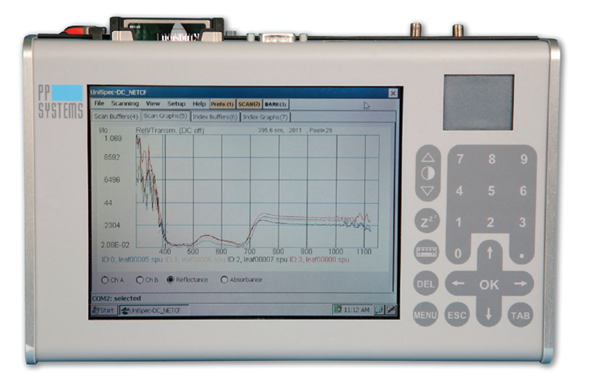 The autoanalyzer also includes an in-line unit for organic P and N analyses. 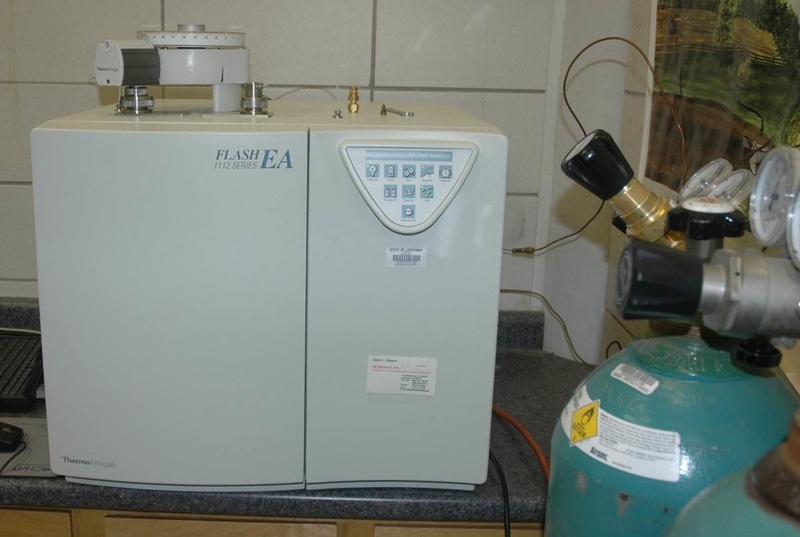 A CE Elantech Flash 1112 Series Elemental Analyzer is housed in Room 222 is used for the analysis of carbon and nitrogen content of water and sediment samples. Particulate organic carbon (POC) and particulate nitrogen (PN) concentrations are determined by filtering a known water volume onto a pre-combusted glass fiber filter and freezing it for storage. Thawed filters are then exposed to hydrochloric acid fumes in a sealed container for 24 h, dried at 60°C before being packed in tin capsules and analyzed in the EA. Sediment C and N content is determined by homogenizing a dried (60°C) sediment sample, placing a known weight of sample in a tin capsule, exposing it to hydrochloric acid fumes, re-drying it and then analyzing it in the EA. 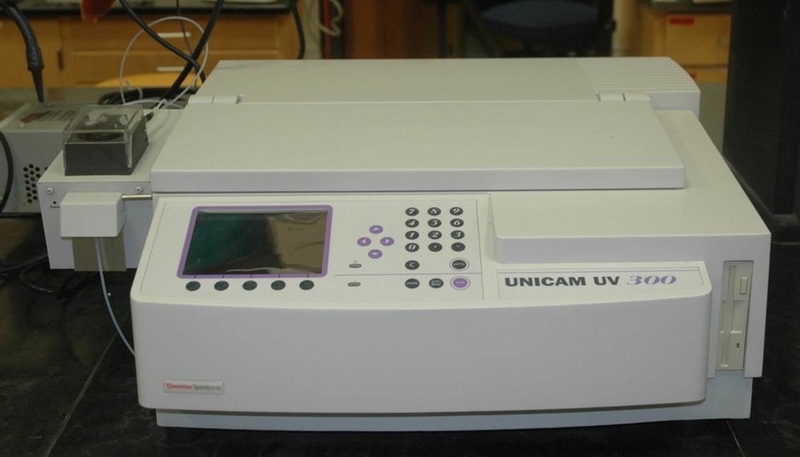 A Thermo Finnigan UNICAM UV 300 spectrophotometer is housed in Room 222. 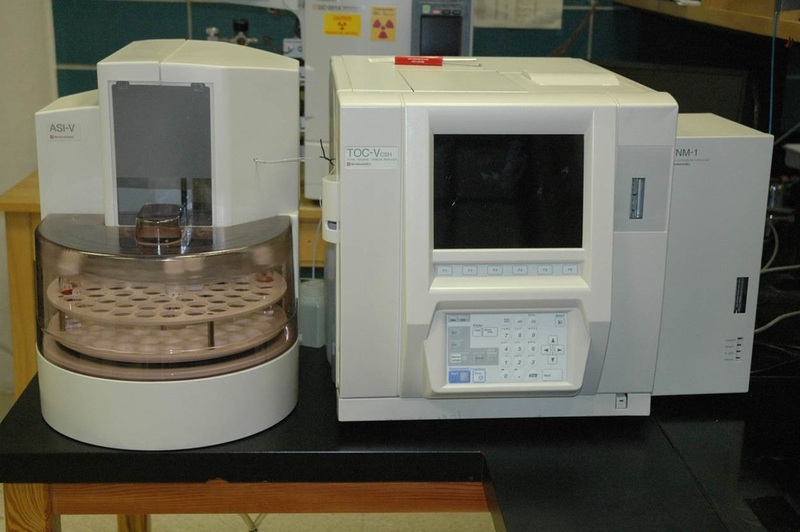 The primary use of this instrument by the Roberts Lab is currently for determining concentrations of total and reduced iron and total aluminum, but the spectrophotometer can also be used for a variety of additional measurements including the determination of concentrations of soluble reactive phosphorus, chlorophyll a and phaeopigments, and water color, among others. 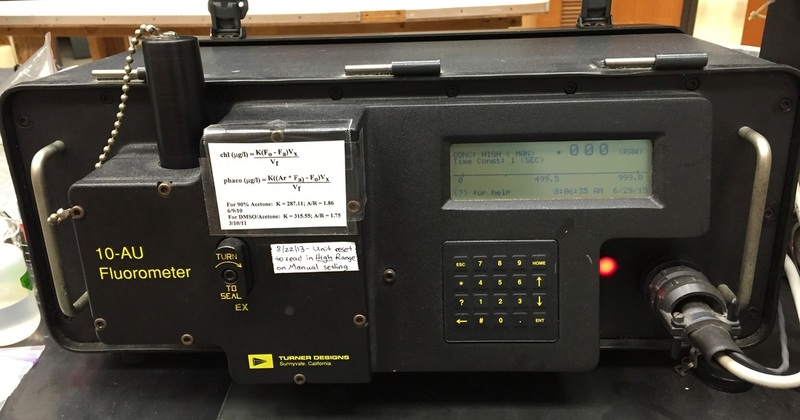 A Turner Designs 10-AU Fluorometer is housed in either Room 218 or Room 206. The primary use of this instrument by the Roberts Lab is for the determination of chlorophyll a and phaeopigment concentrations from pelagic (phytoplankton) and benthic (estuarine and/or marsh sediments) samples. The Roberts Lab has two titrators [models DL 28 (pictured at left) and DL22 ] under our supervision that are usually housed in Room 218. The primary use of these titrators is for analyzing dissolved oxygen concentrations using a modification of the classic Winkler procedure. The automated endpoint detector allows for accurate and precise measurements of dissolved oxygen concentrations which are especially critical in studies of the hypoxic (low oxygen) waters of the northern Gulf of Mexico “Dead Zone” and more broadly in studies needing to make robust measurements of respiration rates.